This is the second page of a 2 page tutorial. Click here to go to the first page. Flattening the image is exactly the same as placing the stack on a piece of white paper. The opaque ink looks exactly the same, but the transparent ink will appear lighter. Something that was 50% red, for instance, will now appear pink. To avoid that, we need to flatten our images onto the colors in the image itself. So, once you have your Alpha channel made, drop the selection, and run the filter. The three filters use different algorithms to determine what colors go where. (There's a manual in the download package, explaining it.) I usually use Solidify B, because it's slightly faster; but it really doesn't matter which one you use. Your image will now be opaque. That's fine, because the transparency is driven by the Alpha Channel. It's in the Channel Palette, not in the Layers Palette. If you want to see it, open the Channels Palette. The colors go from edge to edge, and are as rich and saturated as they would be if you'd never made any of it transparent. If that doesn't make any sense to you, please see the tutorial about what Channels are, and why they aren't Layers. To recap, here are the steps. 1. Make a copy of the file (so you can keep your layered original.) Click the "Create New Document from Current State" button in the History Palette to do this. 2. 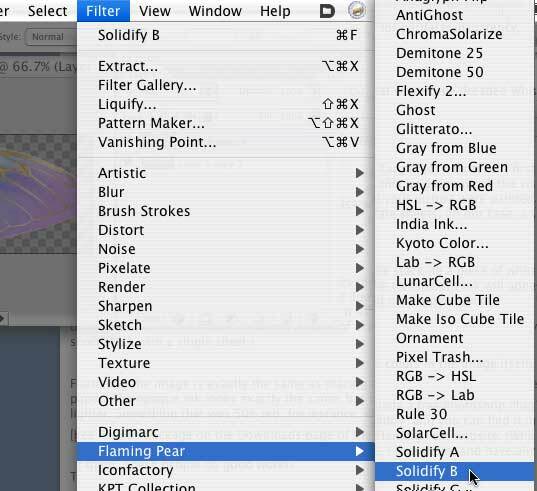 Merge the Visible Layers (Shift Command/ctrl E or use the Layer Palette Menu.) Obviously, if you only have a single layer in your document, you can skip this step. 3. Hold down Command/ctrl and click the thumbnail image in the Layers Palette to select the Pixels on that layer. 4. Go to Select > Save Selection. 5. Select the defaults, and you have a perfect Alpha channel, white where you had opacity, black where you had transparency, and gray for partial transparency. 7. Run the Flaming Pear filter. 8. Save as a 32 bit .tga file. 9. Upload to Second Life. Now, if you are going to be uploading a lot of things into Second Life, it makes sense to automate this process, so you don't have to go through all of these steps every time you need to upload a file. It's lots easier to just open the Actions palette, and click a single button. There are a bunch of Actions in each file, so you have the maximum flexibility when using them. The instructions are included with the file. 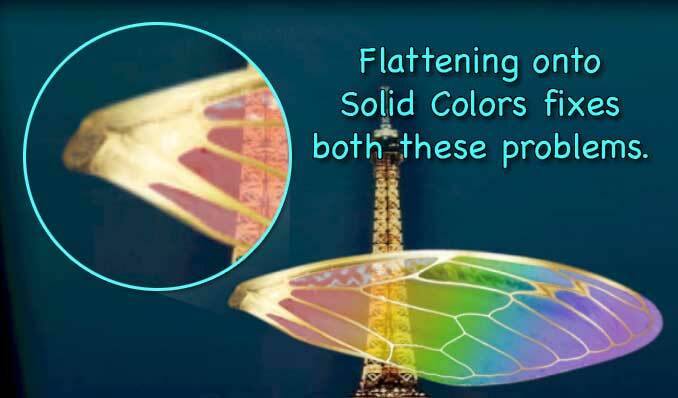 And that's all it takes to make perfect, vibrant, transparent and semi-transparent textures for Second Life! Also, you might notice in some of the screen shots that the resolution of this particular image is 1000 ppi. I scanned it at that resolution, to get a very large, crisp scan for some print work I was doing. I didn't bother to change it, because Resolution is meaningless in SL. 512x256 is the same number of pixels, no matter what the resolution is. Only the print size changes, and we're not printing anything.